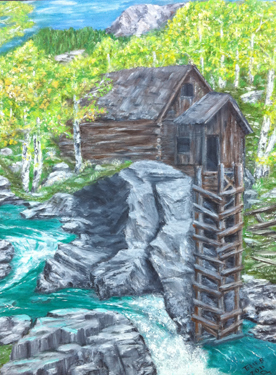 “This painting depicts the Crystal Mill perched precariously above the Crystal River just outside of Marble, CO. It’s original function, as a part of the nearby Crystal Mine operation, has long been lost. It has, however – through changes unforeseen – gained a greater purpose as an iconic symbol of Colorado’s historic mining past. It has become one of the most recognized and photographed symbols of mining ingenuity in the state of Colorado.